KiKi Layne, Stephan James and Regina King star in Barry Jenkins' adaptation of James Baldwin's classic novel. Perhaps it is true what is said, that the world looks different when you’re in love. Colours are fuller and brighter; even a dingy basement apartment can seem like a palace; and you have all the hope that, no matter what obstacles the world might throw at you, you and the person you love can overcome anything. And perhaps no other filmmaker working today gives us a richer vision of love, and the cost of love, than Barry Jenkins. 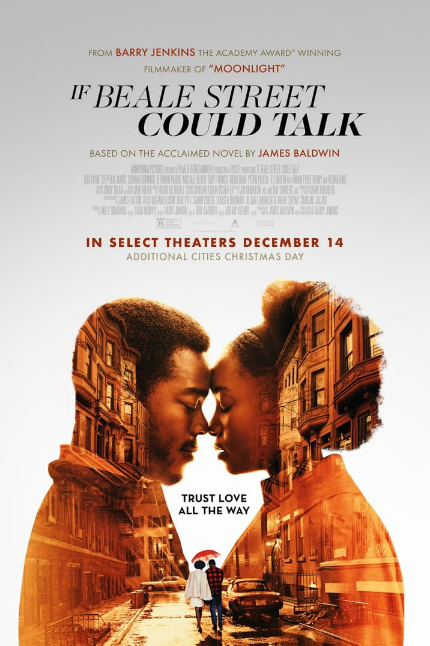 In his latest feature film, If Beale Street Could Talk, Jenkins explores the love between two young people, a love grown out of childhood and youth, a love as rich as we all wish to have. And yet, because they are black and this is the United States, there are forces against them for nothing more than the colour of their skin. And so these obstacles are placed before them, mountains they must decide if they can climb. Based on the 1974 novel by James Baldwin, If Beale Street Could Talk tells the story of Tish (KiKi Layne); she is 19 years old, and pregnant. Her lover, Fonny (Stephan James), is in prison for a crime he didn’t commit. While her family, and his father, are supportive of Tish’s decision to keep the child, his mother is not. As the families struggle to prove Fonny’s innocence, Tish recollects their childhood friendship, their courtship, and their too-brief time together as lovers in the world. Baldwin was one of the most elegaic writers of the 20th century; as a man both black and gay, his insights on America and its culture and politics, both the positive and negative, were poignant, often brutal, yet still held high in his ideal of how things could be, while completely realistic about how they were. This is the perfect source material for Jenkins’ deft hand, as proven in his previous films Medicine for Melancholy and Moonlight. As if often the case with literary adaptations, there is some voice-over narration (by Tish). This is normally a device I dislike, but somehow, I relished it in this film. Perhaps because of how quickly I became attached to Tish, or perhaps because of the beauty of Baldwin’s writing. It adds an extra layer to the narrative, deepening it rather than it being a crutch for what cannot be cinematically conveyed. Jenkins gives the story all the room is needs to breathe, laying out each scene as another piece of the complicated puzzle of these people’s lives. The opening scenes, where Tish first tells Fonny, and then her mother and the rest of the family, are a masterclass in both shot design and acting. No one conveys human emotion like Jenkins, and the performances he gathers from his actors are nothing short of stellar. As Tish’s mother, Regina King is once again a powerhouse, conveying in just a few looks a complex stirring of love, anger, and protection. When she goes to Puerto Rico to find the woman who has accused Fonny of this crime, there is a long take of her, in front of a mirror, putting her natural hair under a cap, putting on a wig, then taking it off again. While this only lasts about a minute, it conveys so much of the experience of black women: the pressure to conform to what white society expects her to be, how it expects her to look, and how she knows it is likely futile no matter how hard she tries (and why should she even have to). This is echoed by the lovers' fathers, who will do anything to help their children, even if it means committing crimes to raise money (an option they take only because white society and the racist criminal justice system allows them little else). Another stand-out supporting performance is given by Brian Tyree Henry, as Fonny's friend Daniel. The two men run into each other on the street, and over beers at Fonny's apartment, Daniel tells of his two-year incarceration on marijuana possession charges. Jenkins moves the camera slowly back and forth between the two as Daniel recounts his time; we already know that this is the future Fonny will soon face, and it is as heartbreaking as it is chilling. But the film belongs to Tish and Fonny. Even within the seeming tragedy of the circumstances, their love is a beacon of light. Cinematographer James Laxton and costume designer Caroline Eselin (both of whom worked on Moonlight), give them the most gorgeous colour: they are the red of love and passion, the yellow of sunshine, the blue of life-giving water and moonlight, the brown and green of the earth and trees. Even in the darkest moments, when these two actors are shown in close-up, looking at each other, their eyes filled with love piercing the screen, I dare any audience member not to fall in love with them. As fellow film critic K. Austin Collins has pointed out in his review in Vanity Fair, Jenkins understood Baldwin's story as a recording of the different lives that black people in America lead. There is no singular experience, and Jenkins brings this out, in both the good, the bad, and the well-meaning but ultimately flawed. If Beale Street Coule Talk is a glorious anthem; a poem of the deepest love; a vision of colour and a testament to pain; an ode to Black America in all of its variations, its beauty, suffering, and endurance. Review originally published during the Toronto International Film Festival in September 2018. The film opens in select U.S. cities on Friday, December 14, and will open in additional cities on December 25 via Annapurna Pictures.